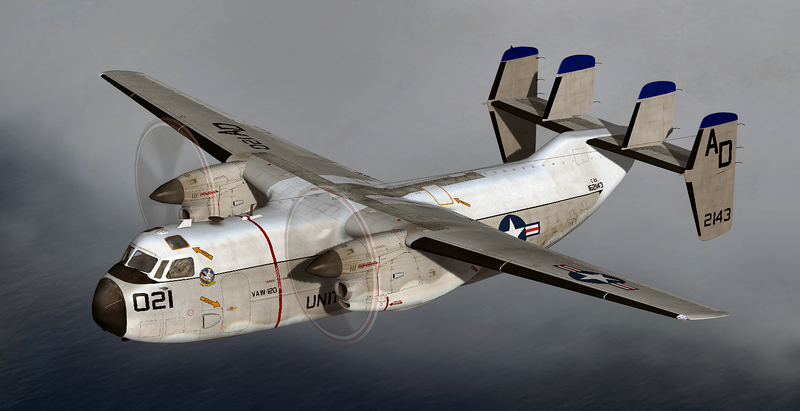 Dino has released his E-2 Hawkeye - C-2 Greyhound package. There may be multiple vendors carrying this prize. Crg! Too many new addons, too many new patches for favorites simulators in the last time. The Life is brutal ! For information a (much requested) paintkit will be released in the next few days - I just need some time to clean it up a little. simply beautiful .. and a top price performance ratio! Hawkeye has landed in FSX. Test flight complete out of NGU in the analog E-2 for now. A few small issues, but I feel this is the above standard quality from you and very happy you took on the project for let's be honest, not the most glamorous aircraft in the fleet, but 2 Grumman airframes with vital mission sets! let's be honest, not the most glamorous aircraft in the fleet, but 2 Grumman airframes with vital mission sets! ...that is precisely why I did them. With the VRS Superbug and my F-35, with this package we now have a good model for each of the fixed wing aircraft you may see on carrier deck nowadays. 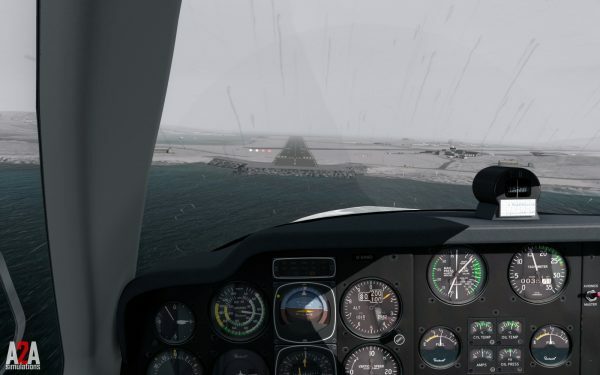 any chances to have update for the rain effect for P3Dv4 owners? From now You can use ths free tool from A2A. C-2 and E-2 will look fantastic with this! It is my intention to upgrade all of my fleet with that rain effect. As for the C-2 / E-2 is a little "early" since I prefer to wait a couple of weeks to make any upgrade to see if any major bug pops-up - this is specially important for this package since there are 4 different cockpit models...so upgrading takes a while. Bought these ladies on the weekend and mighty fine they are but for one thing !?!? All of a sudden (today) I have no control over the port engine on both models ... starts up fine, goes to full RPM and stays there, no control thru my CH Throttle quadrant. Crazy thing is the Starboard engine on both model functions just fine ?? Did a test hop on several other twin's in my collection and no such concern. PS - I have been using "control + shift + R - ready to start the engine's over the weekend with no issues. It is my intention to upgrade all of my fleet with that rain effect. A2A is working on getting the rain effects for muilt-engined aircraft. As time goes on the plan is for the effect to evolve, to enable multi-engine aircraft etc. Well the effects are out there now, real easy to use and free to use, so we hope so too. Limited to singles for the moment, but that will change in the future. Hi - the E-2/C-2 both use custom XML code to simulate the working of the condition levers, as such they may not be fully compatible with turboprop hardware controls. However if your were working fine, I do not think this is an issue. There are some instances in which the engines can get stuck for a while at 100% RPM - they will eventually get back to 60% as expected. Do not start the other engine until this happens. Note that, if you are using P3Dv4, there is an optional better model of the fuel flow gain that improves the engine performance - see chapter 1 in the manual. Sorry - my bad about the RPM percentage. There were some last minute changes to the flight model so that the 87% is not accurate. On my system, in FSX-SE (Thurstmaster T.16000 with just throttle control), the engines settle at about 300 SHP, 71-74% RPM. I encountered the problem you mentioned only once during testing, cause unknown - the situation was solved by aborting the engine start procedure by cycling the condition lever (full forward, then feather and then RUN). On the second attempt the engine ran fine. There may be conflicts with prop-speed levers in some instances. Apart from that, all the cases of reported issues during start-up were due to the condition lever not being set to RUN. Sorry I cannot provide a more meaningful feedback but I cannot replicate the issue. ...not the greatest of the paint kits, but I hope it is good enough. First off , thank you for the prompt response to my snag, not often one gets to chat to the "developer" (himself) when problems arise. Just opened up the paintkits and though not all of the weathering can be removed with a layer, they are very well done and exactly matching the textures makes painting so much easier than textures of puzzled pieces. Thank you for that and two great aircraft. I have a texture in mind for each that I did in the past for the Abacus Flightdeck 5 Greyhound and Hawkeye which were all there was for a very long time. This repaint is a tribute to Rear Adm Sara A. "CLUTCH" Joyner. Adm. Joyner received her wings with TRARON 24 at Beeville, TX in 1991 after graduating with honors from the Naval Academy in 1989. In 2013 she took command of Carrier Air Wing CVW 3 and deployed aboard the USS Harry S. Truman (CVN 75) to the Arabian Gulf. She has flown the A-4E Skyhawk, the F/A-18 Hornet, Super Hornet and Growler. She established her place in naval history as the first woman to command a fighter squadron, VFA-105 in 2010 and as the first female commander of a Carrier Air Wing (CAG). She is now at the Pentagon in Washington DC. I first did this repaint in 2014 for the AB FD5 C-2 Greyhound when with virtual CVW-3. I liked the contrast to the red/yellow/blue of the Rawhides of VRC-40 in the Mid East brown livery. Great repaints gents and Fireball, I'm cool with fictional skins if they look the part. Based off GN P-3's, I could see the E-2 looking just like that. In my air wing, VAW-125 seemed to keep their birds clean, but the visiting CODs of VRC-30 were always rough! Bare minimum maintenance ashore!